Whether you are the business owner or homeowner in Michigan, the thought of dealing with fire is scary. In a matter of minutes, what you have built for years can turn to ashes. Aside from the loss of property, fire damage can also cause tremendous stress on the victim and even loss of life. Fire damage needs a systematic approach to lessen the stress on the homeowner’s part. When a fire is already at hand, the first thing to do is evacuate all occupants of the house. Don’t re-enter the premises until a fire is declared out by the fire marshal. Call your insurance provider to report the situation and to get instructions on how to proceed. It is advisable that you hire professionals to deal with the restoration process as it is a complicated and daunting task. Take note that you are not only dealing with a burned structure and furnishings, but also water and smoke damage. All of these must be addressed at the same time. Board up company’s help is also necessary before any cleaning or restoration starts. A fire-damaged building may have weakened walls, broken windows or a compromised structure. 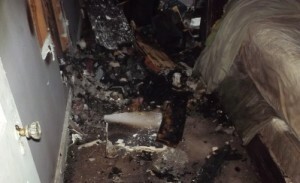 It is dangerous for anybody to walk into the fire damaged property. Securing the affected property must be done to avoid theft, vandalism, falling debris and ensure the safety of everyone, including the cleaning and restoration crew. Rapid Recovery Service can arrive at your home quickly. Wait until trained staff has covered windows, put up temporary fencing and stabilized the structure. If you are allowed to enter the damaged property, take any necessary precautions. Even with the proper board up in place, you should wear a mask because the soot and smoke still present may cause respiratory irritation. Even if it’s a minor fire, don’t turn on the electricity until the wiring has been inspected and deemed safe to use again. Use an outside power source if you need to use fans, vacuum or other cleaning tools. The real extent of fire damage cannot be determined just by looking at it. There may be damage that is not seen immediately, such as structural damage, for example. The cleanup process is complicated. Water, soot, and smoke damaged objects must be immediately separated to salvage as many items as possible. Burned objects, on the other hand, must be placed in a proper disposal container and sent to a proper facility to avoid harming the environment. Fire damage restoration can be tedious, but with the help of professional homeowner’s can expect their property to be treated respectfully and professionally and returned to its pre-fire condition. Aside from that, the safety of the occupants is also assured when the process is properly done. If your home or business has been damaged by a fire, contact Rapid Recovery to provide emergency board up and building securing for your property to protect it from secondary damages, such as vandalism, weather, or unauthorized entries. Rapid can restore any damage to your property by removing ALL residual smoke damage and odor. Trained employees will minimize your stress while maximizing your investments’ value. Rapid works for you. We have a large inventory of equipment to help mitigate damage from a fire. Utilizing specialty equipment and products such as Ozone Machines, Thermal Fogger, Dehumidifiers, Air Movers, Air Scrubbers, Negative Air Machines, and Generators will allow us to immediately address and restore your properties’ air quality. Rapid Recovery Service Inc. adheres to the industry’s three-step process for removing smoke and odor damages. Each step is unique and most importantly, necessary. Deviating from this process will often result in ineffective odor removal. Spray application to all vertical and horizontal surfaces of the affected area Application of a dry or granular type odor counteractant Thermal fogging, this final step utilizes a solvent based deodorizer that is heated and applied as a fog. By duplicating the heat and penetration characteristics of a fire, thermal fogging effectively eliminates most odors. Rapid Recovery Service Inc. offers demolition cleanup for both residential and commercial structures. Our demolition services are safe and efficient and include full site cleanup, removal of debris and contaminated material from the structure. Rapid Recovery Service also offers Content Restoration. We specialize in complete pack out of contents to office equipment. To make sure that you not only get the outside of your house restored but the items in it as well. We store your belongings in a private, secure, climate controlled environment.